Empower CAD and GIS professionals with a reliable, large-format printer they can effectively share. 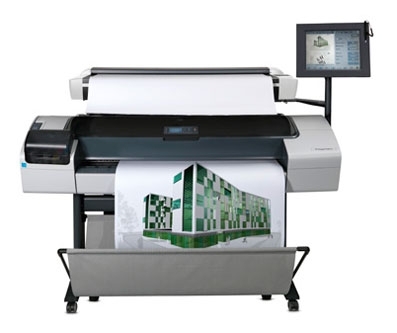 HP Vivera inks enable impressive detail and accuracy, while convenient technical and manageability features enable confident work team printing. Scan Speed: Scan color documents at speeds up to 2 in (5.1 cm) per second (400 DPI Turbo mode) and black-and-white documents at up to 6 in (15.2 cm) per second (400 DPI Turbo mode).